When cold weather settles in and the days are short, it’s easy to slip into a ho-hum mood. Here are three ways to boost your winter mood in a hot tub. When cold weather settles in and the days are short, it’s easy to slip into a ho-hum mood. 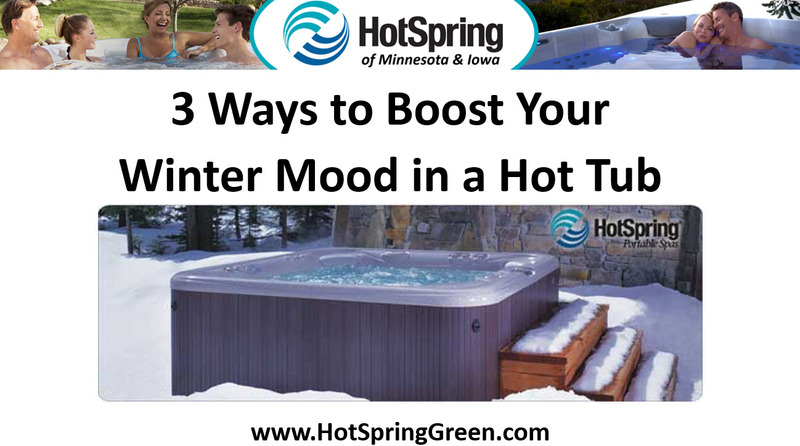 Here are three ways to boost your winter mood in a hot tub. Exercise to release endorphins in a hot tub. When cold winter months keep you indoors, a hot tub gives you the warm outdoor atmosphere encouraging you to exercise. Begin with some light stretching, then ease into a more rigorous workout. Finish your workout with a soothing jet stream massage. Rekindle relationships in a hot tub. When winter weather keeps us indoors, it’s easy for the whole family to slip into a technology addiction. Reconnect with your family in the hot tub. Play games like movie charades or floating board games, or make plans for next summer’s family vacation. As cold weather settles in, achy joints and muscles can leave us wishing for brighter days. A 20 minute soak in a warm hot tub, complete with a targeted jet stream massage, can leave you ready for a relieving night’s rest. To learn more about the benefits of owning a hot tub, pick up a copy of our free hot tub buyer’s guide, 7 Critical Questions You Must Ask Before You Buy a Hot Tub. Go to our website https://hotspringgreen.com/all-guides/ or just give us a call at ☎ 515-270-8702.